Improving operational efficiency for a fleet of public working vehicles enables a municipality to lower operating expenses. SkyHawk Telematics improves the operational efficiency of public service vehicles while increasing the safety of the driver. 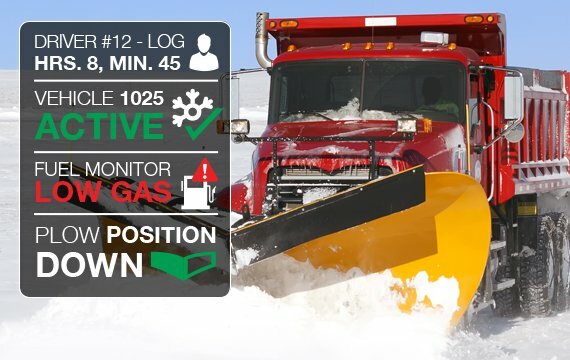 Connecting vehicles through SkyHawks AVL Solutions provides visibility into your entire fleet giving the ability to monitor spreader control, plow position, driving time, fleet utilization and fuel consumption. Live GPS tracking and status helps protect lone drivers in remote areas in case of an emergency, while GEO Fencing creates the ability to utilize vehicles more effectively. The web-based monitoring system requires no software installation and is available from any internet connected device. SkyHawk AVL Solutions can increase your operations efficiency by offering uninterrupted tracking to your entire connected fleet anywhere.